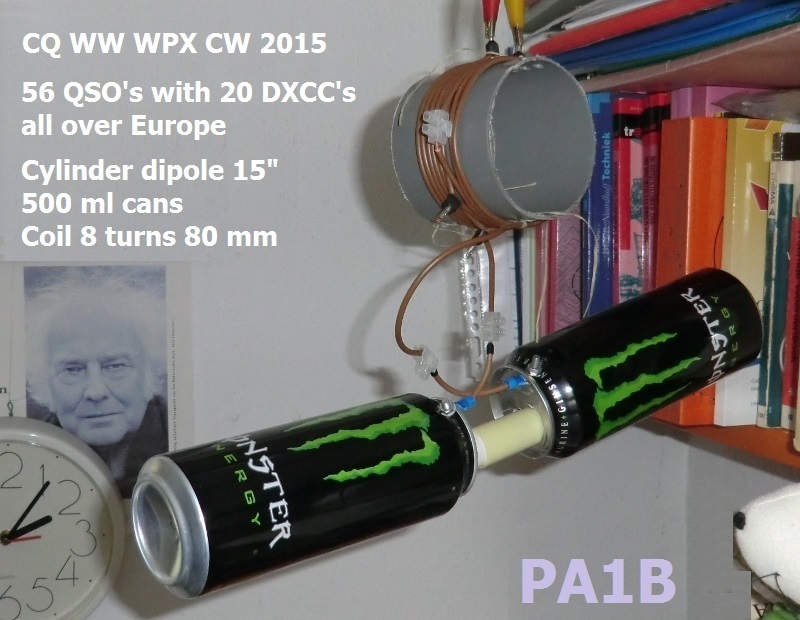 I had great fun in 56 QSO's in CW with S&P, with 20 DXCC countries with an indoor 15" cylinder dipole. 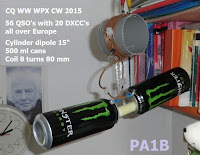 The antenna consist of two 500 ml energy drink cans and a coil of 80 mm with 8 turns. By making QSO's in a major contest, I could discover the properties of this very short antenna. On Saturday I worked with the antenna in the shack, with the antenna 4 meters above the ground. On Sunday morning I placed the antenna in the attic, on a height on 7 meters above the ground. On Saturday I started on 14 MHz. Between QSO #3 and #4 we went to a fair. After working 6 stations all on 14 MHz, I went to 21 MHz. The 15 meter band was open, so I made all QSO's on this band from 12 UTC until 19 UTC. From time to time I went back to 14 MHz, but with NO success. After 19 UTC I could make just one QSO on 20 mtrs. After this QSO an other 16 QSO's were made on 15 m. After 19 UTC the signal were stronger so I could reduce my power. 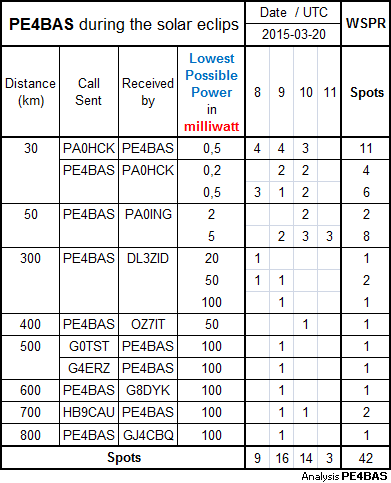 Then I could make QRPp QSO's with 720 mW, 360 mW and even one with 72 mW. When the S-meter goes up my power goes down. On Sunday morning I had time until 10 UTC. The first QSO was made with the island of Man on 7 MHz. To work on 7 MHz I tune the SWR for 1:1. After breakfast I divided to move the antenna to the attic, just to test whether I could make more QSO's on 14 MHz.The test is not conclusive because I made the same number of QSO's at the same time as on Saturday. Between 10 and 18 UTC we visited two birthdays. after 18 UTC I made a few QSO's. Because I had limited time on Sunday afternoon, I can not tell whether the antenna works better on the attic on 14 MHz. But I can tell you that it works. When did you make QRP QSO's with 20 DXCC counties on a indoor antenna? 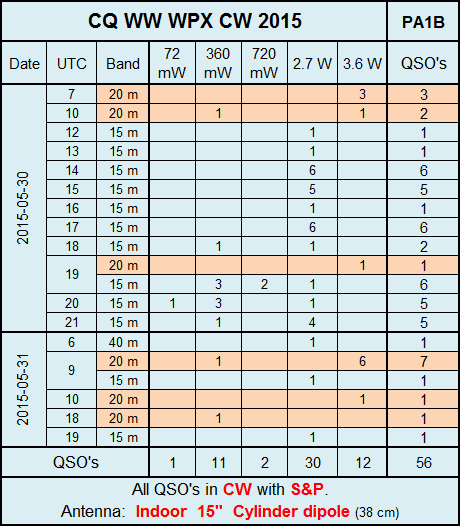 Solar Eclipse WSPR Propagation Analysis (WPA) of spots by PE4BAS. The spots were made on 160 mtr, during daylight hours. On my Blog and website I show information, on how I work with QRP and QRPp and the use of attenuators for more than 1000 Miles per Watt QSO's. Stefano IZ1OQU built a 10 dB attenuator, that I described in an earlier post. (Click to read) With this attenuator Stefano made QSO's with 50 milliwatt in SSB from his home over more than 2000 kilometers, using vertical antenna's. 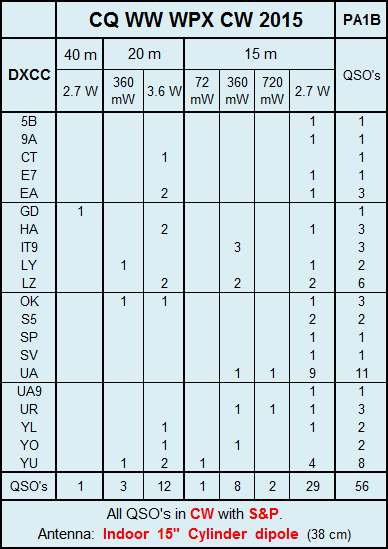 With a difference of 13 dB between SSB and CW, the 50 mW in SSB can be compared with 2.5 mW in CW. Congrats to Stefano, for this great achievement. Stefano has recenly built a light weight attenuator with two sections of 10 dB. He wants to use the attenuator in SOTA and portable operation. Here is the interesting e-mail from Stefano with photo's of the light weight attenuator. I'm IZ1OQU Stefano. I wrote to you some months ago for the attenuators on your website. I'm writing again to show to you the new step attenuator that I've made: with switches and 2x 10 dB steps to reach the 5 mW output with my FT-817. I attached some images of the new toy, made with pcb enclosure. I left one removable side just to shot some photos. You'll see, It's tiny (about 6x3x3 cms size) and low-weight. With that small space it was hard to solder everything but I did it! I'll look forward to find ways to reduce again the size wile adding more steps but not before some testing: you know, SSB is not the best way to play MxW with such little power but I am still newbie with CW. I keep following your blog, I shared it to some friends because they also like MxW, QRP and homebrewing things. The MxW comunity in Italy is slowly growing thanks to the WxM (watt per mile, or mile per watt... anyway we call it, it's the same thing) contest. Stefano will use the attenuator on SOTA and portable operation. FB. To read more, visit Stefano's interesting QRZ page by clicking on the link.